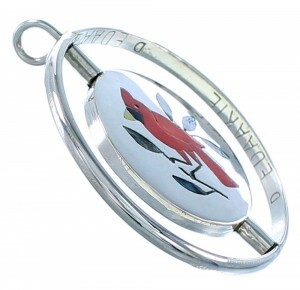 Sterling silver, real Coral, Abalone Shell, Jet, along with White and Yellow Mother of Pearl. This is a wonderful piece of Navajo artistry! This piece of Native American jewelry is Zuni hand crafted by artist D. Edaakie, out of genuine sterling silver and real multicolor inlay. The inlay consists of: Coral, Abalone Shell, Jet, along with White and Yellow Mother of Pearl. 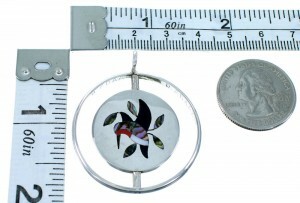 The pendant is reversible, and can be worn on either side. 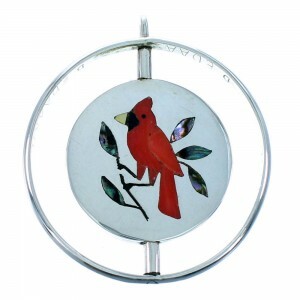 One side depicts and adorable hummingbird design, while the other depicts a magnificent cardinal design. 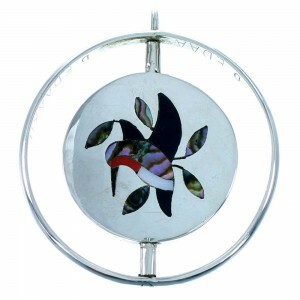 The pendant is hallmarked by the artist.